As many of you know, the government is currently going through a shutdown process. Due to these circumstances which are beyond my control, the Forks Trails that the FATS 50K is normally held on are officially closed and I cannot hold the race out there. Because of the shutdown, I have had to consider options that I normally would not consider this close to race day. One of those options was to relocate the race for this year only. With the help of fellow ultrarunner, Mellisa Warden, we have secured a back-up location for the race that is 27 miles from the Washington Rd and I-20 in exit Augusta, GA. Washington Rd. is where the bulk of the hotels for the area are located and many of you that are travelling to Augusta are more than likely staying at. The drive time to the new course from the Washington Rd exit of I-20 should be roughly 25-30 minutes with traffic and less than that early in the morning. I will have a sign marking Morris Rd. on Hwy 1 and sign at the entrance of the race address. There will be a volunteer out there assisting with parking. This new race site is being held on private land that was generously offered by the land owners to alleviate a situation caused by the governmental shutdown. Please be mindful of their property and do not leave trash anywhere along the course. Furthermore, if you feel compelled, we will have a donation box set up to provide any monetary donations to the land owners for their generosity and willingness to use their land on such short notice. If you have any questions, please do not hesitate to call me at 803.221.4416. As many of you know, the government is currently going through a shutdown process. Since the FATS 50K is held on USFS land; the course is on what is technically considered a National Park. As of right now, all National Parks are closed. With that being said, I’m working closely with the Long Cane Ranger District to get up to date information regarding the use of the trails for Sunday’s race. Currently, the Ranger I am working with is meeting with his supervisors to see what course of action we can take regarding the use of the Forks Area Trails System for the 2013 FATS 50K. Our hopes are that the government will reopen by this weekend and we will continue to have the race as scheduled. In the event of the course still being closed on Sunday; I am working with a private land owner in Aiken, SC (less than 25 minutes from Augusta, GA) to create a back-up course. I will provide the details regarding this course as soon as possible. While this course will not be the same as the FATS course, it will have similar terrain and elevation changes. I appreciate your patience during this time and I will keep you posted as more information becomes available throughout the day. Welcome to the 2013 edition of the FATS 50K! The FATS 50K is 10 days away! I hope you’re as excited as I am about this year’s edition of the race. Please read this thoroughly for important information regarding this year’s race. If you need additional directions, please feel free to reach out to me at my contact information listed below. Parking is somewhat limited at the race start/finish area. Please consider carpooling if you can and parking close enough to vehicle next to you to allow the maximum amount of cars in the lot. Packet pick up will be the morning of the race only at the picnic table at the back of the parking lot. Packet pick up will begin at 6:00 am and end at 7:30 am. 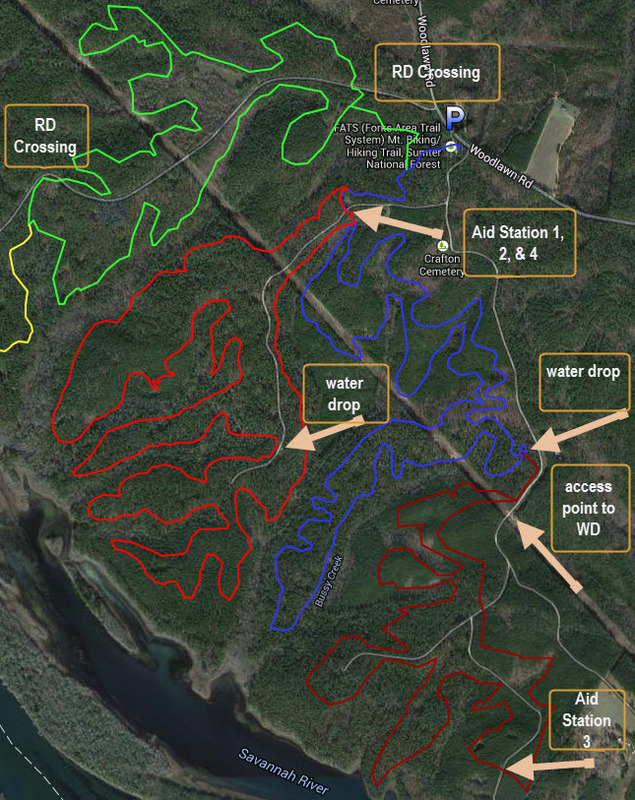 For those of you who have run the FATS 50K in past years, you will notice one change with course signage. No more Styrofoam plates. 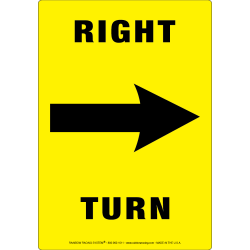 This year I will be using highly visible yellow signs with contrasting black words and arrows to mark the course. 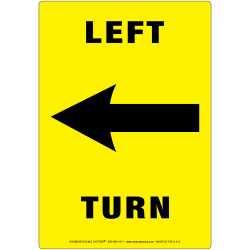 These signs will be at ground level and should visible as you approach turns. 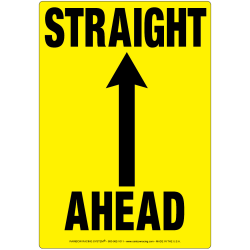 The signs will be posted on the right hand side of the course (when applicable) a few feet before a turn. 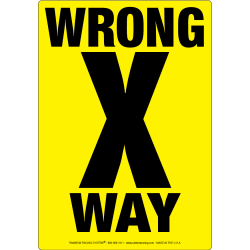 If you start down a trail and see the Wrong Way sign, please turn around and find the correct direction. FATS 50K has two aid stations. The first aid station will be crossed a total of three (3) times. The second aid station will be crossed once. At each aid station there will be a team of volunteers recording your bib numbers as you enter the aid stations. Please be sure to call out your bib number to them so you can be accounted for. Please make sure your bib is visible somewhere on the front of your body. Each aid station will have water, Gatorade, Coke, Mountain Dew and ginger ale to drink. There will be an assortment of gels, candies, fruit, chips, salt and potatoes, S!Caps and PB&J sandwiches. Sorry no filet mignon this year, maybe next year. If you have friends or family that wants to reach you while on the course. There will be a few areas where they will have access to you. They will be able to access you at each of the two aid stations and at the first forest service road crossing on Brown Wave. Please be mindful of blocking access to the two aid stations since we will have volunteers in and out of the aid stations throughout the day. Your crew can also access you on each of the two road crossings on the Deep Step trail. Word of caution for the access on the Deep Step trail, there is little to no room to park vehicles on the shoulder of Deep Step Rd where the trail crosses. Please do not park on the road surface due to the oncoming traffic and obey all traffic laws. Please note that the FATS 50K is held on public use trails and you will more than likely encounter others enjoying the trails on race day. The FATS trails are highly regarded mountain bike trails and people travel from all over the country to ride them. The local chapter of SORBA is aware of the race and is advising riders to use some of the other area trails on race day. However, if you do encounter a mountain biker(s), please step off the side of the trail to allow them to pass since it is easier for the runner to step aside than it is for them to dismount. Generally, the mountain biking community stays away on race day but there is always the possibility to encounter a few riders enjoying their day. The FATS trails are remote and aside from a few access points are hard to get into if someone gets injured or needs assistance. Each trail is marked every half mile with a mileage marker. If you encounter an injured runner try to assess the situation and if applicable, stay with the runner send another runner to seek help from the nearest aid station/volunteer, if you carry your cell phone while running, please feel free to call me directly in the event of an emergency (803.221.4416). Please take note of the closest trail distance marker and which trail you are on. In the event of sudden severe weather, please consider all options and only continue on when it is safe to do so. Please thank and be considerate of the volunteers. Without them, the race could not happen. They are giving up their day to serve you the runner. Any runners becoming belligerent with any volunteers along the course will be considered for removal from the race. Any issues with the course, course markings, timing or other runners should be brought to my attention. Please don’t take it out on the volunteers. Thank you for choosing the FATS 50K and I hope you have a great time and have fun on our trails!